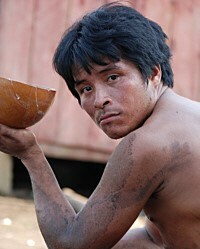 The Achuar are a group of Jivaroan people living on either side of the Ecuador and Peru border. The origin of the Jivaro name relates to several groups of people indigenous to the Maranon River and tributaries found in northern Peru and eastern Ecuador. More specifically, the Achuar number around 5000 and hold the distinction of being one of the last people groups to have avoided changes due to contact with western civilization. The name Achuar refers to the people who live near the Aguaje Palms that are typically found in the tropical areas of South America. They speak a dialect of the Jovaroan language. The Achuar value the domestic household. Their households typically consist of the core family, which includes multiple wives, and other close relatives. Ten to fifteen households will normally form a society living in separate houses in generally close proximity to one another. The wives in the polygamous marriages are usually related in some way or may be the spoils taken from raids of nearby opposing tribes. The standard Achuar home is located near a river or lake but separated with some distance from major waterways to avoid mosquitoes. The structure is a large oval with a high roof and straight sides. There will typically be no exterior walls to promote ventilation. The roof is often made from palm fronds and the structural beams are made from the trunks. Large yards with gardens surround the home. The size of a house plays a pivotal part in the societal ego of the Achuar. Larger houses imply the existence of multiple wives and children and suggest the man is a juunt (great man). Conflicts within the Achuar society are minimal; however, there is a constant struggle between neighboring tribes. The Achuar find refuge in large protected houses that hold six to seven families during times of tribal feud. Temporary walls constructed of palm trees provide outer wall protection for the open houses. Women and men perform separate daily tasks that are necessary for the survival of the family. The women gather and carry the game, with help from their children, while also caring for the gardens, and preparing all the meals. They sometimes have the opportunity to fish with baskets or lines but their role mostly pertains to domestic duties. Men work in the forest to clear ground for new gardens, hunt, fashion tools and hunting devices, and repair the house. Men also gather with other men and discuss current events and concerns while drinking a locally made, crude form of beer. Folk beliefs, shamanism, and witchcraft form the religious thoughts of the Achuar people. They believe in a form of karma, they feel some type of a spiritual connection and sense of duty to the game animals and nature, and they practice enhanced dreams and 'soul journeys' by imbibing hallucinogenic drinks. They rely upon an omen system in order to prepare to hunt game by seeking to have the dreams and/or hallucinations that will foretell their future success. Self-control is a highly valued character trait in Achuar beliefs. Men exercise discipline and will-power in their homes. Examples of self-control would be avoiding gluttony, abstaining from sleep, and respectfully conserving household materials. Another form of self-control is managing their expressions and attitudes, especially in front of visitors. Avoiding eye contact and covering the mouth when speaking are considered crucial for displaying self-control. The Achuar bury their dead by placing the deceased in a hollowed-out log, resembling a canoe. During the funeral of a head of household, the canoe is buried in the middle of the house to symbolize the continuing presence of the late figure. One spiritual belief of the Achuar regarding death is the role of the remaining body parts of the dead body. These limbs are believed to acquire a life of their own and assume the bodies of certain animals. Even though there are Achuar Jivaro Christians, many Achuar Jivaro still practice witchcraft. They need to be reached by missionaries who can bring them the Word of God. Education in hygiene, farming, social order, and the value of medicines would likely be beneficial to this people. View Achuar Jivaro in all countries. 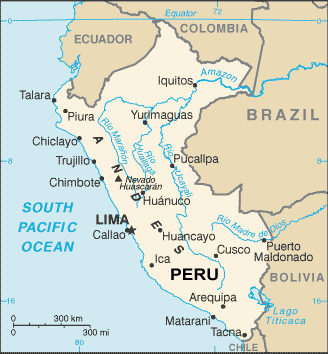 Location in Country: Loreto region: Ecuador border, between Morona and Tigre rivers.